The U.S Food and Drug Administration (FDA) declared the use of e-cigarettes among teens an “epidemic,” and is pressuring Juul and other vape companies to come up with a plan to keep their products out of the hands of adolescents. On Wednesday, September 12, 2018, FDA Commissioner Scott Gottlieb announced, in an open letter, the actions that e-cigarette companies must take to make vaping a less desirable activity for teens. Gottlieb also threatened a potential ban on flavored e-cigarette products. So, what do the companies need to do to comply? Well, the FDA told the top five vape companies, (Juul, Blu, Logic, Vus, MarkTen XL) that they have 60 days to submit a strategy that proves they can keep their products out of the hands of minors. If they can’t, the FDA said, they may demand the companies to “remove some or all of their flavored products” from the market. With finals just around the corner, there is a lot of stress to be found at high schools everywhere, and CVU is no exception. Although students are salivating at the sweet realization that the school year is almost over, there can still be anxiety about final grades, schedules, and the future. This stress can quickly become overwhelming. It’s not just high school students who are feeling the pressure; parents can get caught up in stress about their children’s tests and futures, too. Not to fear though because there are specialists on just this problem that students and parents alike are facing these days. Lynn Lyons is a nationally known expert on anxiety. She has written three books detailing how to cope with anxiety for parents and children, and has appeared on NPR, in The New York Times, and on Katie Couric’s morning show. More and more high school students are suffering from anxiety, and Lyons teaches how the large, heavy mass that is stress can be relieved. Lyons provided a view into why high school students are more anxious than ever. “I think it’s that this generation of parents are the post 9/11 generation and one of the things that makes children more anxious is when parents perceive the world as a dangerous place,” she states. “Since 9/11 there has been a lot more talk about danger of the world, danger about childhood, danger about adolescence, and danger of becoming of an adult,” she continues. This, of course, is true. The world can seem like an awfully dangerous place, and when parents reinforce this perilous perspective on their children, an already scary world can seem downright nightmarish. A unique attribute of “Gen-Z” is the abundance of technology at teenagers’ fingertips. Technology at one’s demand means news, data, and facts at one’s demand, also. “Anxiety demands certainty, and with technology and social media there is this weird dichotomy of believing you can know everything ahead of time and at the same time getting too much information that is really hard to process.” Today’s teenagers are a generation in the midst of school shootings, and a confusing, controversial political environment where any sort of certainty is less achievable than ever. With heartbreaking tragedies popping up on the news frequently, it’s easy for one’s mind to be uncertain whether they are safe or not. Anxiety can creep into a constant restlessness that can translate into a lot of worries about one’s state of being. When they think of emissions, most people think of cars and trucks and things that go. But our diet can have a huge effect on our carbon footprint. Livestock and their byproducts account for 51 percent of all greenhouse gas emissions, according to the World Watch Institute. Essentially, the meat-lovers pizza you order might cost you more carbon than your ride home after. What can we do? I discussed environmental food choices with CVU student Ali Drew, who decided to cut all animal products out of her diet after watching a speech by vegan activist Gary Yourofsky. The main points addressed by Yourofsky included the environmental impacts and the ethics of consuming meat and other animal products. (His speech can be viewed here: https://www.youtube.com/watch?v=U5hGQDLprA8&vl=en.) Drew says that it was difficult trying to replace foods, but she realized that it would be easier to find new vegan foods. A diet without animal products also reduces the amount of processed foods consumed, another benefit for environmentalists trying to change their habits. Don’t you just love the crunch of a fresh bowl of cereal in the morning? The milk, smooth and cold, acts as a wake-up call to get you ready for the day. However, while you were eating, have your eyes ever wandered to the nutrition facts on the box? Although some cereals are notoriously unhealthy, like Reese’s Puffs and Lucky Charms, many other unhealthy cereals are less obvious. This leaves us asking the questions, “Which cereals are truly healthy?” and, “How do you decipher the healthy cereals from the bad?”According to the New York Times, “Honey Nut is America’s best-selling breakfast cereal, and by a comfortable margin.” Honey Nut Cheerios are believed to be healthy because of their high fiber and oats content. Also, the Original Cheerios have low amounts of sugar and are traditionally a healthy breakfast. 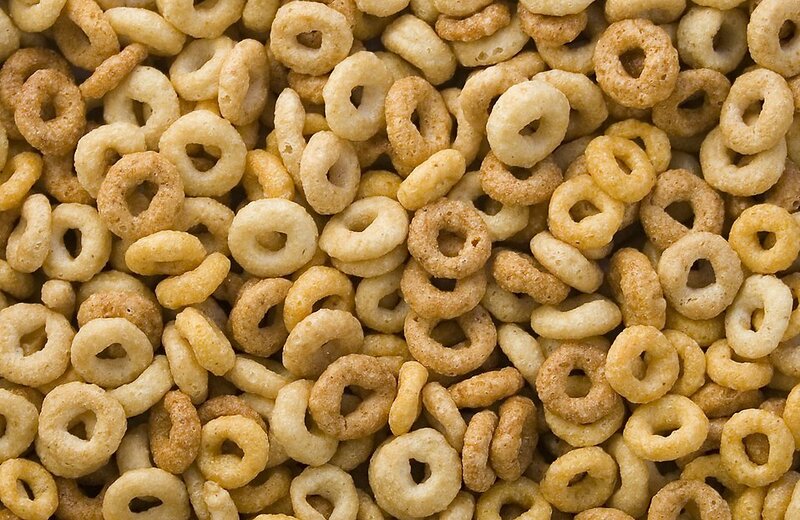 On the flip side, Cheerios’ sweeter relatives such as Honey Nut Cheerios and Frosted Cheerios conceal multiple unhealthy aspects. Honey Nut Cheerios actually have “about nine times as much sugar as plain Cheerios per serving,” says Danny Hakim, author of the aforementioned New York Times article. Hakim goes on to say that, “an Environmental Working Group (EWG) analysis of a number of popular cereals — a report that linked sugary cereals to the ‘nation’s childhood obesity epidemic’ — put Honey Nut Cheerios’ sugar content second only to Fruity Pebbles.” Surprisingly, the sugar content of a seemingly harmless cereal is in reality very high! The EWG also claims that one cup of many cereals, including Honey Nut Cheerios, contains 12g of sugar which is more than three Chips Ahoy! cookies. Each year in the heart of December, Cafe for a Cause takes place in the CVU Cafeteria. Cafe for a Cause is CVU’s way of giving back to surrounding communities in a big way. “Cafe for a Cause is a fundraising event that was started about 12-13 years ago, just as a way of raising money for charities and giving back to the community,” says Leo LaForce, who started the event a year after becoming the CVU’s cafeteria owner/manager in 2004. “This year’s proceeds are going to a local food shelf; Student council specifically chose the Richmond Food Shelf as there is a tie in with the Richmond Food Shelf and CVU, and there was also an article that rose awareness of the fact that the Richmond Food Shelf is particularly struggling this year, so the money will go to the Richmond Food Shelf, but we’re also asking for food donations, and the food donations will go to the Hinesburg Food Shelf,” explains Leo. The food options for this year were similar to last year, featuring many students’ favorite items, kicking off with waffles in the morning, made by your very own Student Council reps.
“Usually, every Cafe for a Cause we do one of the most favored items of the students which is the cheese tortellini in the pesto sauce, so we’ll be doing that, alongside another favorite, Pizza from Dominos, and this time in a complete white dough as opposed to the usual half-whole wheat dough, which students tend to prefer [the white dough], in addition, we’ll have all of the other normal items, the burrito bar, the salad bar, panini’s and things like that,” added Leo. On a summer Saturday morning, I was driving into Burlington. At a stop light, I looked over at a church to my right. A man, in his early twenties was sitting on the steps. He was shivering ferociously, yelling at god, and begging for help. His tremors were not from cold. He was shaking from withdrawal. Beads of sweat trickled down his forehead and soaked his shirt. His body was unable to handle the side effects of withdrawal. He was a heroin addict. This homeless man with torn clothing, could not access a treatment center. His last ditch effort was to sit on the steps of a church and pray, scream, for a miracle. A miracle is “a highly improbable or extraordinary event, development, or accomplishment that brings very welcome consequences”(Miracle). Miracles are meant for things we cannot control, not things we can control like making help available for drug addicts. By funding public drug rehabilitation centers, we can help drug addicts to recover from their addictions. No addicts can do it alone and adequate support is the only way to help with these problems. There is no doubt in my mind that the biggest problem in the country, as well as in Vermont, is the opioid epidemic. No matter where you go, it’s impossible to find any community that has not been affected by scourge of these drugs. Whether it’s an addiction to prescription painkillers, or dangerous street drugs like heroin, we need to dedicate greater resources to fighting them. Opioid death tolls have been on the rise over the past two decades and began to accelerate rapidly in 2011. Opioid overdose deaths nearly doubled over the last five years, surpassing 42,200 nationwide in 2016. In Vermont the death toll was 100. Opioids don’t care where you come from, nor do they discriminate based on socioeconomic status. Twenty of the deaths in Vermont occurred with people who had no high school diploma, however, an equal number occurred with people who had a college degree. No matter who you are, you are just as susceptible to opioid addiction. It’s time as Vermonters, as Americans, as citizens who care for one another, that we take a stand. The big dangers with these drugs, are how easy it is to overdose on them, and the diseases contracted by injecting with unsterile needles. The first thing we must do is preserve the lives at risk, by preventing fatal overdoses. I believe the best solution to that would be to open supervised injection sites. Popular in Europe, supervised injection sites allow addicts to use drugs with sanitary materials, provide treatment consultation, as well as medical help in the case of an overdose emergency. With newer, more potent drugs on the market such as fentanyl, it’s crucial we find a quick way to save these lives before thousands more are lost. These supervised injection sites would provide a chance to preserve lives until users can make the decision to begin the rehabilitation process. The main goal of implementing these sites would be to reduce the immediate health issues that opioid addiction presents, as well as attempting to refer the addicts into treatment. The other preemptive part of this plan would be targeting doctors that over prescribe highly addictive opioids in unnecessary cases. I believe more stringent rules regulating these prescriptions could prevent many people from becoming addicted to these medicines in the first place, before they turn to the cheaper more dangerous cousin, heroin. Attacking the epidemic from both sides of the problem could be the solution to saving lives from opioid addictions. Ed Note: this essay was one of the finalists of Bernie Sanders’ State of the Union Essay Contest. The Redhawk Cafe is now the area of a case that has caught CVU students off guard. The Redhawk Cafe offers a wide variety of tasty snacks and treats. In the weeks proceeding Thanksgiving Break, the cafeteria lost one of its most well-liked treats. The Strawberry Shortcake Pops were not only good, but they sold like wildfire. Now the cafeteria is missing it’s most flavorful treat, and the culprit, health regulations. The missing Strawberry Pops first came to the attention of students during the week of November 13th. As kids funneled through the cafe doors, something felt different. The usual crowd of students wasn’t by the cooler which contained the Pops. The corner of the freezer that normally held the pops was filled with a couple stacks of ice cream sandwiches. “I was pretty taken back by the entire situation! Those pops are a great snack and treat,” comments strawberry pop enthusiast, Sam Weese. I asked Couture how he got his club approved by the school. “We haven’t yet …We already have a club advisor, so the last hurdle is getting it approved as a club, and we’re hoping that that happens. We should be hearing about that soon.” TJ Mead, the Chittenden Core health teacher, is lined up to be their advisor. HINESBURG – At CVU the school cafe plates and bowls have recently been disappearing becoming a costly commodity for the school to handle. CVU has reportedly lost 150 plates in one month. According to the CVU cafe this decrease in the reusable plates is due to students not returning them to the cafe after use or disposing of them in the garbage. At Champlain Valley High school the cafeteria is known as one of the best school cafes in the state. This reputation relies heavily on the work of the staff and how they respond to student feedback. When the CVU environmental club requested that CVU switch to plastic Reusable plates Food Service Manager Leo Laforce made the switch, even though it was a more costly option. Before making the switch CVU used foam plates, According to Leo CVU could buy 140 foam plates for the price of 1 plastic reusable plate. At this price point losing an average of 6 plates a day this has become a large problem for The Redhawk Cafe, and they may make the decision to switch back to foam plates. Have you taken a shower and used shampoo or conditioner today? Have you washed your hands with soap or done a load of laundry with detergent? Maybe you had some margarine or Nutella on your toast. These are all normal things that all of us do, although, what you probably don’t know is that all of these commodities have palm oil in them. Products possessing the substance include, ice cream, soup, lipstick, pizza, instant noodles, cookies, bio-diesel, and unfortunately chocolate. Actually, according to WWF (World Wildlife Foundation), in the US alone, palm oil is included in roughly 50 percent of all packaged food, cosmetics, and cleaning products. So, what’s the problem with that? Well, palm oil is one of the leading causes of deforestation in the world today, destroying life at an alarming rate. Youth Risk Behavior Survey: Are our Students Safe? CVUHS-On Thursday, March 23, 2017 all of CVU students took the Youth Risk Behavior Survey during advisory. The Youth Risk Behavior survey is a survey designed to monitor major common health risk behaviors, and is beneficial as a public health tool to measure the health of the youth. All grades are able to take the survey from grades 6th-12th. The questions asked fall under the following categories: smoking, physical activity, drug and alcohol use, parental expectations, public safety, and acceptance. Though these questions are important, the identity of the respondent is not a variable; the survey overall is completely anonymous. The survey is given every two years for schools to take. Not all school boards agree to give the survey, but most do. According to the Vermont Department of Health, on average about 35,000 take the survey each cycle. In 2015, 99% of high schools participated, and more than 21,000 students completed the survey. Over 13,500 middle school students also participated. Also, nationwide, from 1991 through 2015, more than 3.8 million high school students have completed the survey. Once data collection is complete, the data is processed by the Center of Disease Control Prevention before becoming available for analysis by the state. This can take several months, so the Youth Risk Behavior Survey data is often not available until the following winter. The previous regulations placed on school lunches by Michelle Obama, The Healthy, Hunger-Free Kids Act, put regulations on the amount of sugar, dairy, and white flower in school lunches causing a lot of controversy in schools nationwide. The regulations made kids not want to eat the cafeteria food, which lead to a drop in the income of school cafeterias. How many conversations have you had with your friends where you don’t say sorry at least once for something that didn’t require it? While many people believe that old school manners and the art of etiquette is dying, others are suffering from a very different kind of problem that doesn’t involve rudeness. All around the world, people are plagued by what has become known as the “Apology Complex”, or “Sorry Syndrome”. “Sorry Syndrome” comes in the form of a type of constant verbal regurgitation of the words “I’m sorry” during situations that do not really call for this kind of proclamation of an apology. An apology can take the form of an admittance of guilt, a way of showing regret, or an attempt to show sympathy. The words once used to convey an apology are now being used in everyday conversations. I doubt that anyone has passed by or participated in a conversation in which they have not heard or uttered themselves the words “I’m sorry” when the situation did not really call for an apology.“Sorry Syndrome” has gotten so bad that people assume judgement and feel the need to apologize for simply just being, or just acting in a natural way. But because of a comment or funny look, many of us resort to simply apologizing to the people around us for being ourselves. HINESBURG — CVU health teacher from Chittenden Core, T.J. Mead, spent this last Wednesday teaching his students about the painful realities of drug addiction. The students took action working on the simulator that T.J. designed to help students understand what addiction was and how it affects teens. T.J. started his class by asking the students to define what they thought addiction meant. The lesson T.J. was teaching was about the effects of drugs and how that applied to the teen brain because the brain is not fully developed until the age of 25. So you’ve heard the saying, “think and it shall become” but what does this actually mean? Does the idea that your mind has the power to create and change your reality actually have any basis in fact and statistical evidence? There have always been people who have told you that your brain has the amazing ability to create its own reality based on your thoughts and regular thinking habits and patterns, so how exactly does this work and how can we use it to our advantage? The definition of the statement “Mind Over Matter” is one that refers to the ability of thought processes to influence our physical reality. UCLA scientists and colleagues from the California Institute of Technology have collaborated to complete studies that show humans can regulate the activity of specific neurons in the brain. According to the UCLA Newsroom our brain can “increase the firing rate of some [neurons] and decrease the rate of others”. If our brain has the ability to exert its control over which neurons fire and when, this means that it can choose what we focus on and “override the visual reality”. Perhaps the best example of the power of the human brain to manipulate and create our own visual reality is what is known as the Placebo Effect. According to Dr. Mercola, “A placebo is an inactive treatment or substance, such as a sugar pill or sham procedure, that looks and feels just like a regular medical treatment. Patients receiving a placebo generally believe it is the same as the typical standard of care, and many experience what’s known as the “placebo effect” – an improvement in symptoms – even though they received no actual “active” treatment.” In patients with certain ailments or injuries, studies have shown that just the belief that a pill has the ability to heal and repair your body can have the same effects as if the patient actually had taken a pill with the ability to bring about this healing medically. This is because the brain is tricked into believing in this pill and its abilities and therefore it tricks your body into healing normally as if the pill’s effects were really at play. ScienceDaily reported out about a study done at Baylor College involving patients with knee pain and osteoarthritis where 180 patients with knee pain were randomized into three groups. One group had torn or loose cartilage removed, the second group underwent arthroscopic lavage (the bad cartilage is flushed out), and the third group underwent simulated arthroscopic surgery where small incisions were made, however; no instruments were inserted and no cartilage was removed from these patients. The recommended number of hours a teenager should sleep, according to the National Sleep Foundation, is seven to nine; in reality, only fifteen percent of teens are getting that amount. Between blue light from screens, distractions from devices, homework, procrastination, and early school starts — teenagers have a lot to deal with. It’s no surprise that so little get sleep, but that’s no excuse for more than eighty percent of teenagers to lack sleep so often. There’s a certain beauty to the irony that I am falling asleep at my keyboard as I write this. The problem with sleep is that it is easy to go without it for a night, but that could mean up to a week of recovery. Many teenagers, and adults, haven’t felt what being truly rested feels like in a long time. With so much going on in life, it’s easy to put off sleeping for later. After all, sleeping takes up valuable working time, and seems so trivial. However, recovering a night of sleeplessness isn’t as simple as it seems. Sure, missing a few hours the night before a big test can be reversed with a few more hours of sleep the days after. Unfortunately, when you miss a few hours for a week or two, things start to get complicated. 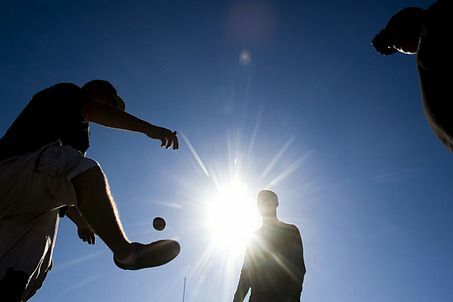 The footbag feud: fun or fitness? Racing back from the Stone Age, Footbagging has made a drastic come-back among youth, and even adults. Footbagging is a sport and fun backyard activity that anybody can play. It requires no more than a simple round bag filled with sand or dirt and your feet. Many people who are completely uneducated and inexperienced in this activity are very easy to spot because of their use of the words, “Hacky Sack”. In this case, “Hacky Sack” is a direct meaning for, “I don’t know anything and am very stupid.” By using the word Footbag instead, you immediately give off the vibe of superior intelligence and skills. The rules to Footbagging are simple; you can use any part of your body other than your hands and arms to keep the bag in the air. Usually, people use their feet by kicking the bag straight up into the air at roughly eye level, over and over again and passing it to other players. It may not sound like much, but the second you make a successful kick, you’ll be hooked for life. Many people believe footbagging to be a high-intensity requiring a lot of flexibility and strength, but not according to footbagging amateur Kaelan Murdock: “I find footbagging to be quite peaceful and calming. In fact, I can never footbag without doing some sort of meditation or mindful breathing techniques at the same time. It helps me focus on my foot-eye coordination and balance. I’m surprised that no one has come out declaring footbagging as a form of meditation.” According to Soren Kurth, a footbag specialist who shares a similar opinion to Murdock, “Whenever I footbag, I play music in the background, usually sounds of nature and chimes. It keeps you in the correct mindset which is having a calm and sturdy soul and empty mind. This makes it a lot easier to make your kicks and stalls much more natural and effortless. It’s almost a form of yoga in that you’re keeping an empty mind, but being be aware of your body and surroundings along with keeping a steady breathing pattern.” Very interesting perspective from Kurth and Murdock. Lucky Charms are a classic cereal that are among the most popular. But should they be? To me, Lucky Charms are only half good, at best. Half of the cereal is tasteless and leaves a weird residue in your mouth, the other half is marshmallow that is more styrofoam than anything else. Every bowl of this cereal has left me feeling unsatisfied and sad. Lucky Charms are bad tasting, not very healthy, and, not even very lucky. In my research, I have found that I am not alone in this feeling. CVU senior, and breakfast cereal enthusiast, Walker Storey, says that the marshmallows are “way too sweet” and that the other pieces are “too hard to wrangle.” Storey also describes them as “the grossest things of all time”. CVU senior Colin Monsey also agrees that the marshmallows are too sweet. On the other hand, CVU senior Natalie Gagnon says she would like the cereal if it was only the marshmallows, and it would be called “Lucky Marshmallows”. While people have different reasons, they agree that Lucky Charms are an overrated cereal. People who disagree with me may say that the cereal has to balance healthy and unhealthy to be both good, and good for you. While the gross brown things may taste healthy, they aren’t as good for you as you’d think. Every cup of this cereal has 2.6 grams of fiber, which is only 0.1 grams more than Cinnamon Toast Crunch, a much better cereal. Adrenal fatigue just means you’re tired, right? Today, adrenal fatigue represents a bigger picture that encompasses more than “just being tired” and a solution that can’t always be found through just catching up on some lost sleep. AdrenalFatigue.org states that adrenal fatigue is “a collection of signs and symptoms, that results when the adrenal glands function below the necessary level.” So what are the adrenal glands, and what do they do exactly? The adrenal glands are two glands located on top of your kidneys that produce both nonessential, and essential hormones in your body. The outer part of the adrenal gland is known as the Adrenal Cortex, and this is the area of adrenal glands that helps to produce hormones essential to the regulation and control of metabolism, stress, and blood pressure. The inner area within the adrenal gland is known as the Adrenal Medulla. This area oversees the production of hormones such as adrenaline in situations where a fight or flight response is triggered. Adrenal fatigue is a result of long-term emotional or physical stress or chronic infections. Adrenal fatigue is not a condition that is obvious or easily identified because you may not exhibit any signs of physical illness, yet you are unable to relieve your fatigue by sleep. In general, it may be hard to spot someone suffering from true adrenal fatigue because their symptoms may simply come across as that of someone who is just worn out or tired. The doctor who first coined the term “adrenal fatigue” warns that if someone were to continue to let this constant weariness and exhaustion go on, in serious cases they will experience difficulty getting out of bed for more than a few hours every day. Dr. James L. Wilson says that as your adrenal functioning reduces consistently, the various systems in your body become more heavily affected. This is because your body is attempting to find ways of compensating for the decrease in adrenal hormones; your body will alter your metabolism, the balance and levels of fluid in your body, and your cardiovascular system and heart rate.